Camping is something that many people enjoy doing with their whole family. The problem is, when you bring your whole family along, you’ll need a lot of room to be comfortable. That’s why there are many large tents, so everyone can have their space and still have a good time. Here we have reviewed 5 of the best large camping tents on the market, so you can see which one will suit you and your family the best. This tent is perfect for eight people to bunk in or a family that wants a lot of space. It has easy setup, which only takes a few minutes. It also comes with a divider so you can separate the tent into two rooms for privacy. Besides that, it’s tall enough to stand up inside of it and the whole tent stays dry, even if the weather isn’t ideal. There isn’t a special electrical port in the Coleman 8-Person Instant Tent so you may have to run the cord through a door if you need electrical hookup. 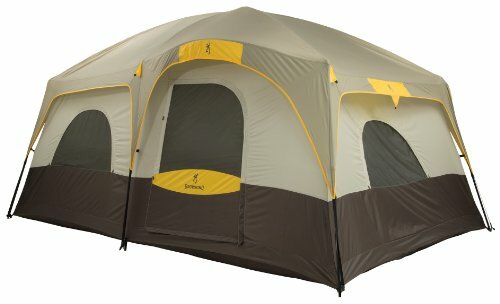 On the plus side the walls in this tent are thicker than most, so it’s much more durable than the other tents on review. This tent is designed to sleep up to 10 people, so it’s perfect for a large group or family. It has two doors and many windows, so there can be as much air flow as you need. There are also large vents on top of the tent to keep it cool. Furthermore, the exterior material is weatherproof and there’s plenty of room, due to the unique design. There is also lots of storage and you can separate it into two rooms, if you need to. This tent may have a small problem with leaking in some cases. However, this is a condensation matter, as this one will keep you dry if you encounter rain. The Mountain Trail also has many storage options, which is a great feature considering how many people can use this tent at one time. If a ten person tent is what you’re after you should also consider these options. This product is designed to sleep up to six people but can also be used by less. It has a few extras that aren’t widely seen. For example, it has a handy storage loft near the ceiling, there’s a ground vent to let air out or in, and there’s a special area to put an electrical cord through. There are also large doors, windows, and lantern hooks, so you don’t have to be sitting around in the dark. Some users have reported that you must be careful with the zippers on this tent because they can get caught. Just take your time and close the doors slowly, and this problem shouldn’t affect you. The Core 6 Person Dome Tent has lots of commendable features though that a family or larger group will appreciate, the storage loft and ground vent are two such features. This tent is specifically designed for a family to camp in style. 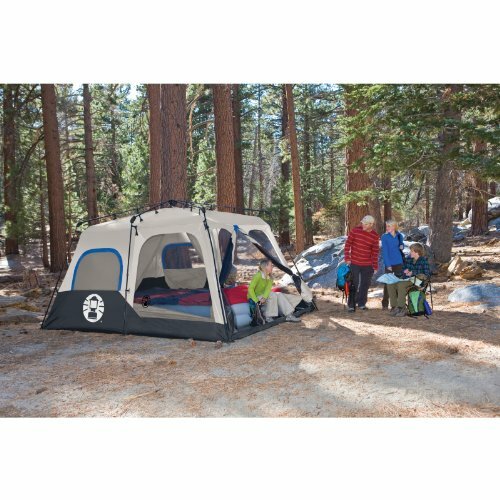 It’s a large freestanding tent that stands tall so you can move around in it with ease. Besides that, it has something for everyone. The material that the tent is made with is quite durable and there are storage pockets throughout the inside. There is also a divider for privacy and plenty of ventilation between the door and windows. This tent may sway or move around a bit in windy weather. However if the Browning is secured to the ground properly, this won’t affect you too much. It is a nice tent that has plenty of room and also looks nice too with its brown and light brown coloring. The 2nd Coleman tent up for review is the Octagon 98 Tent with half rain fly. Unlike the other tents on test this is a large tent with a difference. Most tents on the market ultimately have a square or rectangular shaped footprint, this Coleman employs an octagonal design. It may prove a halfway house in terms of looks for those who have considered a Teepee design. For sure this tent stands out on the camp ground and is certainly unique looking. But does this shape offer any other advantage? In a word yes. If you live or camp in windy conditions then this could be the tent for you. The 8 sided structure creates a really sturdy and solid frame that can cope with harsh winds. Add to that Coleman’s WeatherTec system that essentially waterproofs the tent from above and below and you have a product that’s great when the weather isn’t so good. Of course the nature of the review is to look for some great large tents. With the room divider up this tent will accommodate 2 queen size air mattresses or fit 8 in sleeping bags. This is at a push and if you plan on taking lots of gear that need to be housed during the night then a smaller group might be better. There’s definitely a lot to like here but there are some small negatives. Yes the welded floors don’t let water in but some previous buyers have said that it feels a little thin and there are concerns over the long term durability. An additional ground sheet would help and prevent any sharp points from piercing the floor. This is a very good large tent option. It has a good center height for taller adults and will accommodate 8 at a push. As with other Coleman models the Octagon 98 also has their color coded assembly poles and WeatherTec system built in. 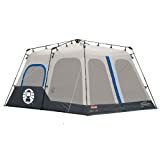 If you like the quirky looks then this is a great large tent that will easily withstand what nature has to throw against it and is also reasonably easy to assemble and take down again. It’s worth mentioning there is also a version of this tent that incorporates a full rain fly. It’s a little more expensive but might be worth considering as an alternative if protection from rain is a priority. What you gain in water tightness you lose in ventilation. The full fly version is being discontinued by Coleman. Each of these huge tents is great for a family camping vacation. However, the best models of large camping tents out of this bunch in joint first place are the 2 Coleman products. 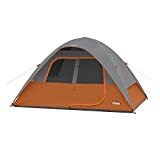 The Coleman 8-Person Instant Tent has enough space for most large groups, comes in a few different colors, and it is easy to put up. You may still need two people to do it, but it won’t take too long. More importantly when you’re low on energy at the end of your trip it isn’t hard to take down either, so you can clean up your campground and leave quick and easy. The Coleman Octagon 98 enjoys all the same benefits but adds additional stability. However the quirky looks of this large octagon tent won’t be for everyone hence the joint first place. The Browning Camping Big Horn Family Tent gets second spot it’s good for a family that don’t want to give up their space or privacy. It has straight walls and there’s room to get up and move around. Pair that with the large doors and windows, and you have a home from home. The Mountain Trails Grand Pass Tent might prove a good option for some larger groups because it can sleep so many people. It’s the easiest to keep private because of the way it’s designed and it has plenty of ventilation features so you don’t get too hot. It also protects from the wind and rain, which is a plus when you’re fighting with the elements. There are also two large doors, which means you won’t have to wait in line to leave the tent either. 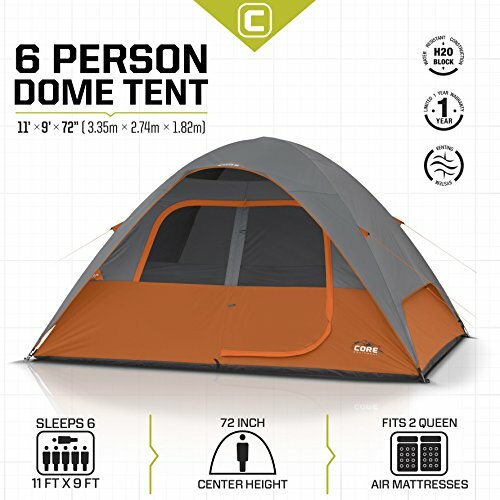 Finally, the CORE 6 Person Dome Tent is something that is perfect for a small family. It has all the extras you need and even has special ventilation features in addition to its windows. Furthermore, there’s a lot of storage space, so you can keep all your essentials inside the tent with you. It’s fair to say that the products above could be described as large or big camping tents. If you really do need something bigger then check out these huge camping tents, these are designed to sleep up to 12 which should be enough for most. 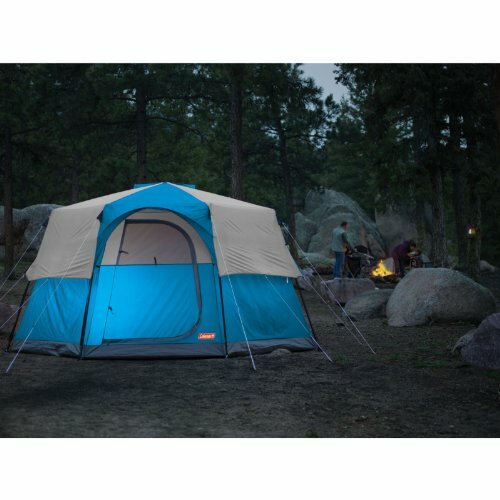 The largest tent we’ve reviewed is the 14 person Ozark which has a unique plus (+) shape to it. Remember with larger tents there generally comes more weight, a longer set up time and less stability. So if you do need to sleep more you could also consider 2 smaller options, or a large and a small.